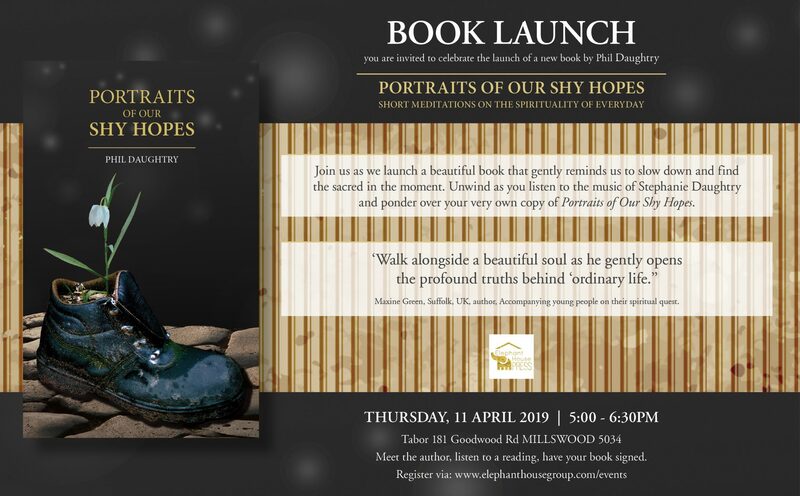 You are invited to the launch of Phil Daughtry’s new book Portraits of Our Shy Hopes. Let’s celebrate together as we present Dean of Humanities and Social Sciences, Phil Daughtry’s, work to a world in need of the gentle reminder to slow down and find the sacred in the moment. Unwind as you listen to the music of Stephanie Daughtry with a glass of wine and ponder over your very own copy of Portraits of Our Shy Hopes. All royalties will be donated to the Indigenous Literacy Foundation so by purchasing a book, you will be helping to send culturally appropriate books to communities that need them. Please RSVP before 8th April. Phil Daughtry is a senior manager at Tabor and he teaches in the field of contemporary spirituality. He has a reputation amongst his staff as a caring and empowering leader. His students speak of his gentleness, clarity of communication and capacity to teach critical and reflective thinking skills. Phil is active in research and participates in international conversations about the place of spirituality in life, work and society. His own spiritual journey is one that is shaped by contemplative practices from the Christian tradition and a progressive theological worldview. When not at work, Phil is happiest in the garden, on his BMW motorcycle tourer, fishing, camping, spending time with his wife, adult children, partners and grandchildren, and supporting the Adelaide United Football (soccer) Club.